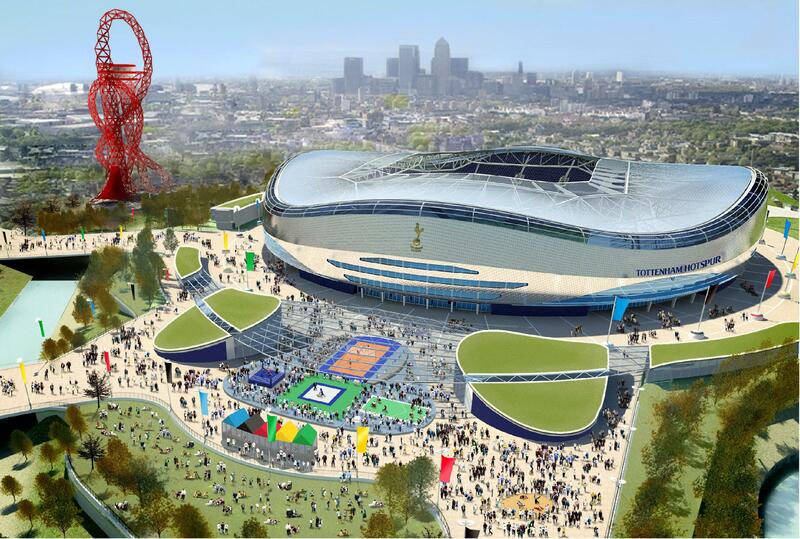 I'd expect a better mock up if the OS is awarded to Spurs, then the designers can go to town much like they did with the now dead in the water Northumberland Development Project (it's dead in the water). At the moment however, we are teased with a rather strange single piece illustration. Not sure what irks me more. The buildings central in the background or the tall red monstrosity looking down at the stadium (never red damn you!). Don't even get me started on the break dancers. I can see it now. Headhunters v the Spurs Yoof. Body popping in Burberry. Couple of other things in there that hardly appeal to the common football fan, but yes, it's a mock up and if you look closely to some of the design photos of the NDP they actually included a skating rink. Once more, I'm placing my hope that Levy is masking his true intentions. Would hardly make sense to tell us there will be a referendum then once more brutally state that there is no option available other than a move to East London. Unless his mind is getting cloudy with the PR soundbites (unlikely). To further cement the contradictions, note the usage of the word 'current' in his comments on the NDP being dead in the water. Reading too much into it, am I? Then again, if my hope that this is a grand game of poker rings true, what if we are awarded the OS? I guess, either way - Levy will get what he wants. Just no pleasing all of us I'm afraid. Also - couple of things I saw this morning that made me giggle. "Karren is a good businesswoman but she doesn't understand football"
Yes, yes, Levy has contradicted himself aplenty with the promises and shattered dreams but I'm beginning to wonder whether his greatest weapon is West Ham's inability to fight their corner. Or if you believe in the conspiracy theory, it's possibly the greatest threat to remaining in N17. Mainly because even with all the bad hype about Spurs and the legacy, many involved in the process of seleciton see the Spurs bid as being more viable (hate that word). But as mentioned already, either way Levy will win.